Finding appropriate gifts for people can be a tricky thing, but if you happen to have a Land Rover fan in your family, there's a whole range of products available in the Land Rover collection online that they will be sure to love. This year Land Rover celebrates its 70th anniversary, and there are a selection of items to celebrate including pin badges, lanyards and sets of models. 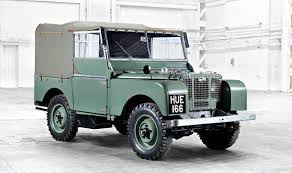 The Land Rover collection online also features items themed around HUE - HUE 166, the first ever production Land Rover now preserved at the British Motor Museum. Items include cufflinks and keyrings with HUE's registration plate. Models of HUE are available in two different sizes, featuring the iconic pale green paint and canvas roof. There are also notebooks and organisers in the same distinctive green. There's a HUE teddy bear for younger members of the family, and the dog can get in on the act too with HUE themed feeding bowls and collars. In addition a range of items celebrate the crossing of the Darien Gap - the toughest part of the British Trans-America Expedition of 1971 - which proved the ability of the recently launched Range Rover. So tough was terrain that the six-man team with a pair of Range Rovers only managed three miles per day through the Darien Gap itself. Items on offer here include phone covers, mugs, luggage, badges and more including bottle stoppers styled like Range Rover gear selectors. Many of the items feature stylish artwork of the expedition; these include a set of coasters, made from printed steel which will protect your furniture and look great into the bargain. If you are a serious Land Rover user there is also a range of Barbour clothing suitable for the sort of tough environments where the vehicle is capable of taking you.